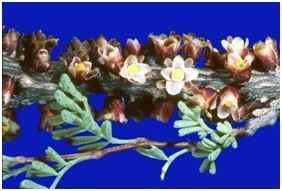 Floral scent is likely important to the pollination of parasitic plants, despite that it has not been well-studied. We studied the pollination ecology of the North American stem holoparasite Pilostyles thurberi (Apodanthaceae) at two field sites in Texas. To identify effective pollinators, we collected floral visitors to P. thurberi flowers, observed their foraging behavior, and looked for P. thurberi pollen on their bodies. Augochloropsis metallica bees (Halictidae) and eumenine potter wasps (Vespidae) were pollinators. P. thurberi flowers are visually inconspicuous but produce a strong fruity fragrance. GC/MS analysis of whole floral extracts and dynamic headspace samples revealed the fragrance to be an unusually simple bouquet of raspberry ketone and several eugenols. Comparison of scent profiles to those from uninfected host plants (Dalea formosa) allowed putative separation of parasite and host volatiles. This is the first report of the constituents of floral fragrance in Apodanthaceae.